This small neighborhood known locally as the Santa Cruz neighborhood, is, in my opinion, the best part of Alicante. It’s the only place where you can taste a part of Alicante’s past. The houses are all a bit ramshackle and bundled together on the side of the road, but up in the higher areas, the houses are well-maintained and better decorated. The small neighborhood is found right next door to the historic areas shadowed by the castle higher up to the right. The path to and from the castle offers some beautiful panoramic views. Above everything, there are a few viewpoints where you can see the coast and the bay on both sides of the city. 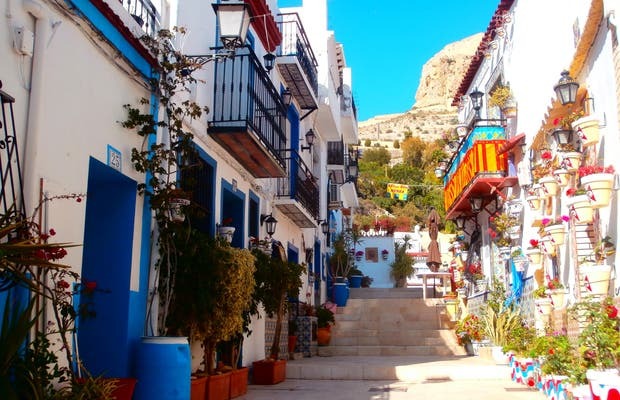 On top of a hill near the castle in Alicante, there’s a very special neighborhood, the most authentic and charming one in the entire city. In fact, it’s quite surprising for many visitors who don’t know it exists (as was my case). It has traditional white houses and the distinct sensation that time has stopped. It’s one of those areas where you see the locals sitting on chairs on their porches and you can’t help but bid them good afternoon. It’s not easy to get there since there isn’t a great road connection, but it’s sure got to be nice living there, in your own little paradise with those wonderful, old-fashioned houses.